Based on the quality of the original and the trailer for the sequel, I was more than eager to catch up with Ron Burgundy and his eccentric news crew. 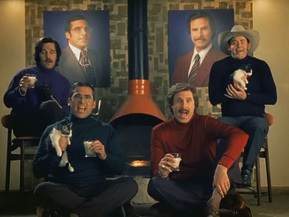 The first Anchorman (2004) was a sleeper, but a crowd-pleaser nonetheless, and thanks to DVD and cable, its fan base steadily grew over the years - so much, in fact, that it was supposedly die-hard Burgundy devotees that prompted Will Ferrell to even consider revisiting this character. But after seeing Anchorman 2: The Legend Continues, I wish he had simply left fans wanting. That would have saved him some embarrassment and us the displeasure of sitting through it. It’s hard to say what exactly went wrong with Anchorman 2, since the underlying agenda of these movies is to satirize the news industry and bring to light its questionable ethics and substance. Given everything we know (and assume) about the news, this doesn’t seem hard, and it’s certainly a juicy and targetable topic. But the problem seems to be that Ferrell, along with co-writer and director Adam McKay, are too aware of this, and their approach to the material comes across as lazy and presumptuous. Instead of honing in on a specific aspect of network news, they go after a wide assortment and operate under the assumption that just because they’re lampooning news, the gags and jabs are automatically welcomed and funny. They’re wrong, because almost everything about this comedy falls flat. In the film, Ron Burgundy (Ferrell) has survived the 1970s and transitioned over to 1980. He and his wife, Veronica Corningstone (Christina Applegate), are thriving as co-anchors in San Diego and have an eight-year-old son named Walter (Judah Nelson), although Burgundy can barely relate to the kid. Word around the station is the highly revered veteran, Mack Tannen (Harrison Ford), is stepping down and wants to appoint someone internally to take over as nightly news anchor. Indeed he does, by promoting Veronica and firing Burgundy. And who could blame him? Just as we saw in the original, Burgundy consistently mis-reads the teleprompter, gets his facts mixed up and curses on-camera. Needless to say, Burgundy doesn’t take the news easily and gives Veronica an ultimatum: it’s either him or the job. She chooses the job and Burgundy ends up as host of SeaWorld’s dolphin show. Ready to call it quits and hang himself, he’s approached by Freddie Shapp (Dylan Baker), an agent for the recently founded Global News Network (GNN), who wants Burgundy and his pals to help spearhead the first 24-hour-news channel. Burgundy rounds up his former crew, including Champ (David Koechner), the latently homosexual sportscaster who now runs a chicken restaurant that serves fried bats; field reporter Brian Fantana (Paul Rudd), who’s found success as a cat photographer; and weatherman Brick Tamland (Steve Carell), who’s just as absent-minded as ever, believing himself to be dead and then giving the eulogy at his own funeral. They all head to New York City and are disheartened to learn they’ll be filling the 2 a.m.-5 a.m. time slot. The coveted primetime block goes to the chiseled pretty boy Jack Lime (James Marsden), whom Burgundy unintentionally makes enemies with and bets he and his crew can garner higher ratings. Ron’s method: instead of telling the audience what they need to hear, tell them what they want to hear, which includes letting Americans know how great they are and resorting to trivial and highly lurid stories such as cute animals, home runs, hurricanes and live car chases. He brushes aside the “boring” and “unlikely” stuff, such as global warming or the idea China might become an economic superpower. Like the original, Anchorman 2 touches on the social and workplace changes of its time. In this case, it shows a woman, specifically an African-American woman named Linda Jackson (Meagan Good), holding a position of power and delegating orders to white men. Good is one of the movie’s few bright spots, bringing a convincing and fierce energy to her role. She goes beyond just making her character a simple stereotype and actually makes Linda fully realized. It also examines the idea of a rich foreign tycoon, an Australian born with a silver spoon in his mouth (Josh Lawson), owning an American corporation. These subjects are all fine and good, but there have been more biting and acerbic movies made about them before. Even so, Anchorman 2 could have earned a pass had it actually known what to do with them. It brings them and other situations to the table but wrongly assumes they’re funny by default. For instance, the relationship Brick strikes up with a socially awkward secretary named Chani (Kristen Wiig) is more obnoxious than amusing (watching the two of them scream at the top of their lungs proved to be annoying). And when Burgundy finds himself blind, living in a lighthouse and raising a shark, I was left scratching my head. Ferrell and McKay needs to realize that just because something is bizarre and outrageous doesn’t necessarily make it humorous. But I wasn’t pleased, and at this point, the movie was beyond saving. It’s long, dense and surprisingly dry. Anchorman 2 sure seemed like a good idea, but that goes to show the idea of something and the execution of it are two vastly different things.